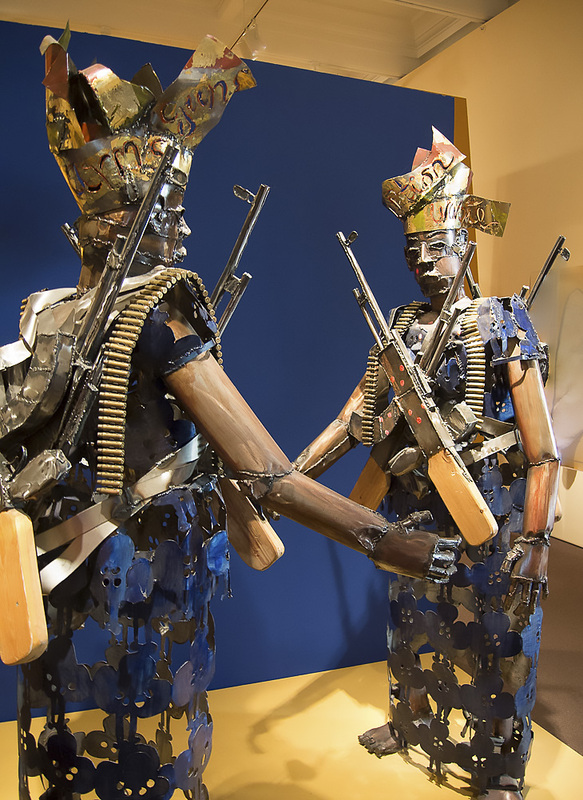 In this satirical sculpture, a Nigerian woman slings AK-47 rifles and ammunition belts over her traditional clothing— is she imitating the fashion of her teen-aged male children? Two traditionally dressed [Nigerian] women are armed with imported AK-47 rifles and ammunition belts.They satirically impersonate Nigerian male youths, who casually wear “accessories” of violence—such as machine guns, bazookas, and rounds of ammunition—in their attempts to seize control of oil-wealth from oppositional factions. 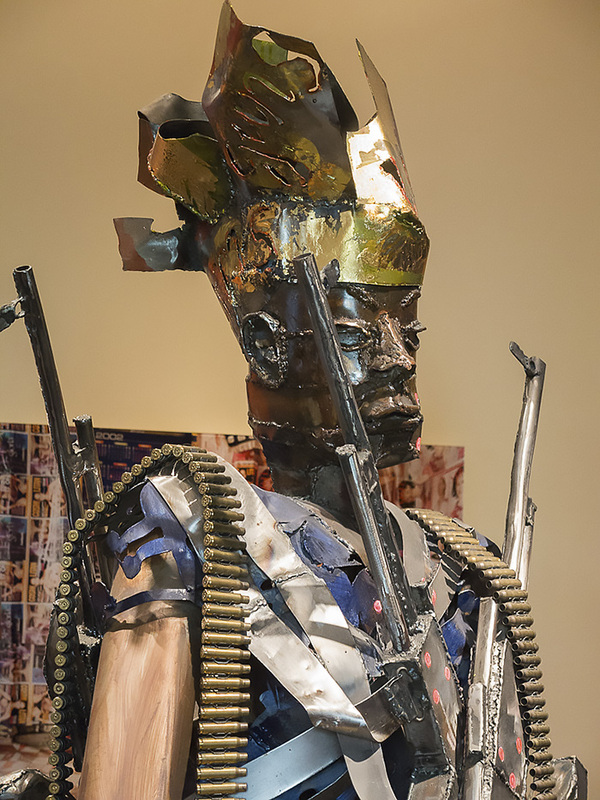 Sokari Douglas Camp’s sculptures often protest the devastating and violent impact of oil economies on local communities. Since the 1970s, the oil-rich Niger Delta region of Nigeria has been torn apart by violent conflicts tied to the nation’s oil economy, which have left women vulnerable in their everyday lives. I am very conscious that my home in Niger Delta is in a very bad place at the moment because of pollution and lack of employment. I work hard, thinking of positive things that could happen – I feel that the negatives are so big that if we talk about them all the time we will have nothing to look forward to. Funnily enough , this brings out humour in the work I make. So, maybe the sculpture is humorous, but I find it disturbing and perhaps a little creepy. If you want to see more creepy images, check out the Weekly Photo Challenge, Creepy. This entry was posted in Stanford and tagged Photography, Postaweek, Weekly Photo Challenge by carto. Bookmark the permalink.